Visit us regularly to keep your teeth happy and healthy. teeth need some extra help, we have you covered! We have a fun play area for your children! Top of the line, safe and comfortable environment. A trip to Dr. Chalgren's dental office is like a trip to the spa. Everyone is so gentle, kind, and thorough in their treatment of my children and me. There are plenty of toys to engage my children while they wait and the treatment rooms are bright and full of fun pictures for them to make them feel comfortable. The children and I look forward to our dental visits. Thank you, Dr. Chalgren! I finally found my dentist! I haven't been to the dentist in SEVEN years because I tend to be a scared patient. Dr. Chalgren and his staff were so calm and caring. They have a very relaxed vibe...everyone looks and acts extremely professional but they smile and laugh and put their patients immediately at ease. The visit was virtually painless, and they gave me practical, no-nonsense advice about how to best care for my teeth at home and whether or not to get my wisdom teeth out. My last dentist recommended a bunch of flashy, expensive treatments and I never trusted him to tell me what I actually needed. I trust Dr. Chalgren completely. Dr. Bob is a pretty cool dentist. Scheduling an appointment is easy! Simply give us a call and we’ll help you select a time that works best for you, or fill out our contact form and let us know what time of day you prefer. At Copper Country Family Dentistry, you have found a dentist and team committed to providing you with compassionate and exceptional care. From first contact with our office, you will find that we listen to your needs, make you feel welcome and put you at ease. We have built an exceptional team of dedicated, caring and experienced professionals committed to the dental health of you and your family. Our new office, directly off M26 in Houghton, is designed with your comfort and convenience in mind. Our team sees beyond your smile and realizes that your comfort and confidence are equally as important as your oral health. That’s why we take great care of both the smile and the person behind it. Our mission is to provide the highest quality dentistry and compassionate patient care available from a dentist and team in the Copper Country. We offer a wide range of treatment options that can be personalized to meet your unique needs, expectations, and financial abilities. Explore the rest of our website for helpful practical information, including bios, service details, patient education resources and directions to our office. We recommend printing the new patient forms and completing them in advance of your initial appointment to allow us to get to know you better upon your arrival. Whether you are new to the Houghton and Hancock area or seeking an improved dentist experience, we invite you to call our office for additional information. 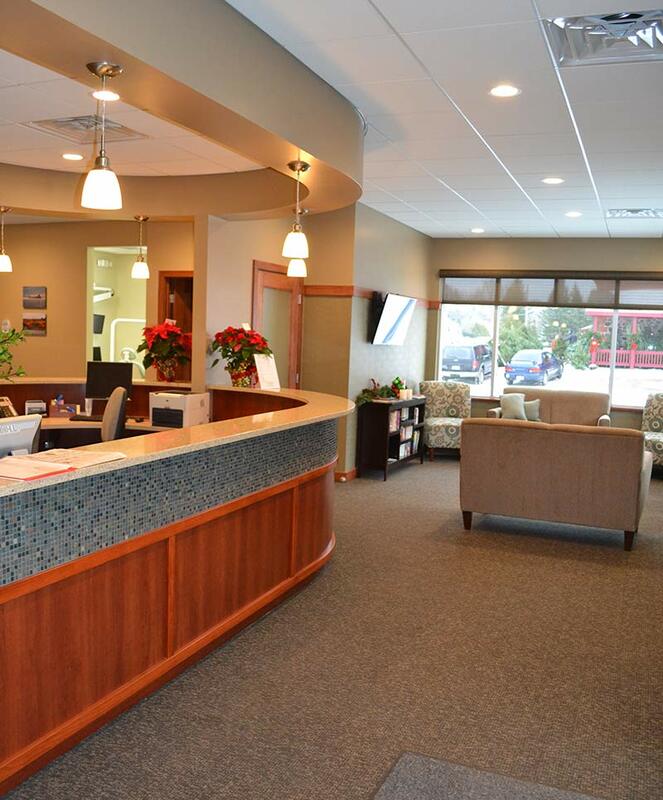 We look forward to meeting you and welcoming you and your family to your new dental home.